Before Cody took to the stage, it was the task of Thabo and the Real Deal to warm up the anticipant crowd. The soul infused rock band was a perfect compliment for the headliner at the Ruby Lounge a couple of nights ago; a venue that seemingly manifested into a classic jazz lounge- the prefect setting for the artists on the bill. Showcasing a sound that is less frequent in the current climate but just as stylish and silky as it first was. 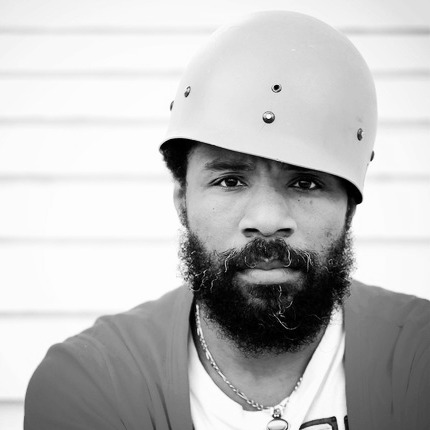 The Cody Chesnutt story has been one full of intrigue and mystique. The 2002 debut ‘The Headphone Masterpiece’ harked back to the blissful neo-soul of Erykah Badu and The Roots whilst maintaining an undercurrent of incredibly strong songwriting. His first London show last year was a sold out night at the Jazz Café that was songs intermitted with Q&A which fuelled the Chesnutt fascination. When the headline tour for 2013 was announced it was no surprise that the venues had grown. Cody’s sound isn’t one that is seeing a wide renaissance as such, but it is certainly one worth celebrating. The live show is the definitive proof of that. As Cody stepped up, his charisma and quirkiness were immediately apparent, from the signature war helmet, to the dynamic movements on stage… a stoked crowd was inevitable. His fan base is almost cult-like enamoured with his is humility and airtight songwriting. Kicking off the set with That’s Still Mama demonstrated the silky smooth and immaculate voice of Cody, pervaded with intricate keyboard and drum solos throughout. This night was not fulfilled without the consistent interaction between artist and crowd, Cody beckoning a soulful response and exchanging courteous gestures with the lively and willing spectators. It seems like this interpersonal fan base hasn’t wained underneath the strain of growing success. Cuts from his third studio LP ‘Landing On A Hundred’ were met with affection and It was a praiseworthy and successful night for the American artist, who is celebrating the recent release of his latest album. His sound has sharpened and become a lot more polished since ‘The Headphone Masterpiece’ but has maintained Chesnutt’s charming organic appeal. Whilst the sound is born out of something organic- ‘Landing On A Hundred’ shows that it has grown in to something far more refined. A heartfelt, groovy and passionate performance from an artist who has worked hard to earn this kind of recognition.